The promised Mahdi, who is usually mentioned by his title of Imam-i “Asr (the Imam of the “Period”) and Sahib al-Zaman (the Lord of the Age), is the son of the eleventh Imam. His name is the same as that of the Holy Prophet. He was born in Samarrah in 256/868 and until 260/872 when his father was martyred, lived under his father”s care and guidance. Sayyida Hakima who was the sister of the 10th Imam (Imam Mohammad Taqi(a.s.)) relates that she went to her nephew”s (11th Imam – Imam Hasan Askari(a.s.)) house for iftaar on the 14th of Sha”ban 255 A.H.The 11th Imam asked her to stay as his son was to be born soon. There was no sign of pregnancy on Sayyida Narjis. The 11th Imam asked her to recite Suratul Qadr on Sayyida Narjis. At the time of Fajr on 15th Sha”ban Sayyida Hakima heard the Sura being recited from the womb of Sayyida Narjis. 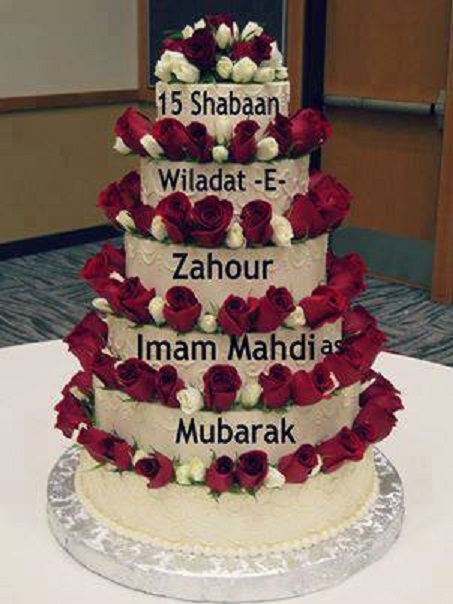 The 11th imam told her that the birth would occur very soon. “And We intend to bestow (Our) favours upon those who are weak in the land and make them the Imams (leaders) and make them the heirs”. “The truth has come and falsehood has vanished; Indeed falsehood (is a thing by nature) vanishing”. The 11th Imam only told a handful of his most trusted believers of the birth of his son and to a few of his household slaves.One of the women slaves called Naseema relates that when she went to see the baby Imam in his cradle she greeted him with salaam and was replied to. She then sneezed and the Imam said: “Yarhamukallah – it is a blessing from Allah and you have 3 days immunity from death”. The last Imam(a.s.) was hidden from public view and only a few of the elite among the Shi”ah were able to meet him. After the martyrdom of his father he became Imam and by Divine Command went into occultation (ghaybat). Thereafter he appeared only to his deputies (na”ib) and even then only in exceptional circumstances. The Imam”s ghaibat (occultation) was in two phase – Ghaibat-e-Sughra (minor occultation) was for about 69 years – 260 A.H. (872 A.D.) to 329 A.H. (939 A.D.) and the Ghaibat-e-Kubra (greater occultation) started in 329 A.H. (939 A.D.)and will continue until Allah(swt) so wills. the 6th Imam, Imam as-Sadiq (a.s.) states the reason of the ghaibat as prevention against being killed. Ishaq bin Yaqub (on authority from 12th Imam) says that all the Imams were under oppressive rulers. Our 12th Imam is hidden in order to rise in arms with obedience to no one. Muhammad Yaqub Al-Kulayni has said that ghaibat is a test from Allah to test the steadfastness of belief in Imam. If he is to remain in Ghaibat, what is the use of his existence? Belief creates hope giving strength to the oppressed. It is a deterrent for the committing of injustice as one is always aware of the constant presence of the Imam. Why insist on 12? Why Imamat not continued and last Imam near Quiyama to do 12th Imam”s work? For one who is to cleanse the earth of all wrong and injustice is necessary for him to be born near early Islam and carry pure and pristine Islamic ideas. It is necessary to look from his vantage point at all the upheavals in the world. Personal experience of the past will make him fearless of the seemingly invincible superpowers no matter how strong they are. It is said that at the age of 11 years he was a servant in the house of the 9th Imam(a.s.) later to enjoy the confidence of Imam. He occupied the same position of trust with the 10th and 11th Imam who told their Shias that after him they would not see the 12th Imam and would have to obey Uthman. After the 11th Imam”s martyrdom Uthman moved to Baghdad and disguised as a butter seller he set up the collection of khums for Imam. He served the 12th Imam for 18 months and received a letter near his death from Imam(a.s.) telling him to appoint his son Mohammed as the next representative. He continued in his fathers footsteps also acting as a butter seller. He managed to keep Imam”s existence a secret from the Abbasids until the early years of the reign of Al-Mutadid. The rulers then started searching hard for Imam and killed countless mu”mineen with even the slightest resemblance to Imam. Spies were set up to probe the khums network. Imam issued an order for Shias not to take his name nor show mas”ala of khums to anyone until absolutely sure of them. As instructed by Imam he appointed Husayn bin Rawh as the next representative after his death in 305 A.H.
His kuniyya was Abul Qasim. His sociable nature won him respect even from the Ahlul-Sunnah. He managed to keep his activities a secret from the rulers whilst maintaining good relations with them. It is to him that we address the “ariza” to be delivered to Imam. He served faithfully until he died in Sha”ban 326 a.h. revealing the appointment of Ali bin Muhammad Samry after him. He served for only three years. A week before his death he received a letter from the Imam(a.s.) telling him of his forthcoming death and that there would be no representative after him and that Imam(a.s.) was now going into Ghaibat-e-Kubra (major occultation). Imam(a.s.) would then appear when Allah(swt) wills it. Ali bin Muhammad Samry(a.r.) died on 15th Sha”ban 329 A.H.
Imam”s ghaibat is described by the Aimma like that of Prophet Yusuf (A.S.) who was amongst his brothers yet they did not recognise him.
. It is reported that 30 people all over the world meet with him regularly. It is also reported that Jaziratul Khadra (green islands or Bermuda Triangle) is a vast land in Imam”s kingdom occupied by a large number of Shia and governed by Imam”s family. Pray for the safety of Imam(a.s.) at all time. Be in waiting for Imam(a.s.) at all times. Whenever faced with difficulty (whether small or big) ask for assistance from Imam(a.s.). However various indications have been given by our Aimma. – It will be the day of Friday. – It will be the 10th of Muharram. – The century will be an odd number. – There will be both a solar and lunar eclipse in the month of Ramadhan but contrary to all norms and calculations. – A voice will be heard announcing the appearance of Imam which will be heard by all in their own language. There will be a loud noise from the sky with which the eardrums will pierce. – Nasibayn (Iraq) will burn on all four sides. – Basra will be abandoned. – Turkey will be ruled by Usmanis. – People will usurp that which they are trusted with. – People will “kill” Salaa. (It will not be abandoned but its essence destroyed). – People will carry music in their pockets. “A great man from the people of Qum will rise up and take a stand. He will invite people will invite people towards the truth. Brave people like strong mountains, not fearing fighting and having trust in Allah will come to his help………. Finally the enemy of Islam will withdraw………….. The rule of Islamic Law will be established by the people themselves”. “Kufa will become barren of Islamic knowledge……….. whilst Qum will become the centre of Islamic Fiqh………… so much so that it will spread throughout the world that not a single person will remain ignorant of the message of Islam”. “These people will be the vicegerents of the 12th Imam. Their rule will continue and link with the appearance of the 12th Imam. They will not entrust the rule established by them to any but Imam on his reappearance”. – Imam Ali (a.s.) took Kumayl bin Ziyad to the outskirts of Kufa and showed him where he was to be buried. He then told him that all round his grave there would be tall buildings carrying the sign of Shaitan on them. The sign would be called Antennae. – Imam will appear in Makka and his “zahoor” will be in two stages (similar to Prophet hood of the Prophet). 1st Stage – This will be in secret and not announced to all (only to close followers). 2nd Stage – Open announcement on the 10th of Muharram (Ashura). – In the Zil-Hajjah of the preceding to Imam”s appearance on Ashura, 40 momineen who will be Imam”s closest companions will realise the nearness of “zahoor” and go for Hajj. They will not return home and on the 15th of Zil-Hijjah they will go to the Ka”ba and cry a lot. – One of them will be called by Imam(a.s.), introduced and told to be the representative of the 40. They will all meet Imam(a.s.) between the 16th and 22nd of Zil-Hijjah. Imam will tell them that one of them will have to announce the arrival of Imam(a.s.) at the door of the Ka”ba but whosoever would do this would be killed immediately. – On the 25th Zil-Hijjah the announcement will be made and the announcer killed (This is the blood of Nafse Zakiyya – pure soul, those whose blood will touch the Ka”ba and who is mentioned in numerous prophecies). His blood will be avenged 2 weeks later when Imam(a.s.) will appear himself at the Ka”ba. – Those who answer the first call will be 313 in number. – Imam”s army will consist of 10.000 momineen. – Imam will establish his government in Kufa and his treasury in Masjidus Sahla. “The call in the name of QAIM (i.e. Imam Al Mahdi (a.s.) ) will be made in the night of the 23rd Ramadhan and he will make his appearance on the day of Ashura, the day of Imam Hussain”s (a.s.) martyrdom”. “Shaitan will not leave the people alone. He will call late in the night and will plunge people into doubt”. In the 13th volume of Bihar-ul-Anwar, Imam Al-Baqir(a.s.) is quoted as saying that “The Qaim (Imam Al-Mahdi(a.s.)) will send one of his companions to Makka and will ask him to inform them that I”m sent by so-and-so to you and that we are the merciful Ahlul-Bayt and the Store-house of “Risalat” (religious guidance) and “Khilafat” and we are the progeny of Muhammad(pbuh&hf) and from the time that the Prophet of Islam(pbuh&hf) left this world until now, we”ve been oppressed and deprived and our rights have been usurped. So we call you to befriend us. When that young man will utter these words, he will be caught and beheaded between “Rukn” and “madam” (in Masjidul Haram) and this young man is the “Nafse Zaki”………. And between the death of the “Nafse Zaki” and the re-appearance of Imam Al-Mahdi (A.S.) there will not be a gap of fifteen nights”. According to the Masumeen(a.s), Muslim countries will seek aid from non Muslim countries. This is already evident in a number of Muslim countries. Another prediction that is come true is that 60 impostors will claim to be Prophets. By their attractiveness, their persuasion, and their personality, they will misguide the people. 58 false Prophets have already emerged since the days of the Prophet (s.a.w.). We have only two more to witness. A loud voice will be heard from the sky. Sufiani will appear and wage a fierce war. Makka and Medina in the desert of Baida. A Seyyid descendant of Imam Hassan (a.s) will emerge with his army. The army of Seyyid-e-Hassan and an image of a man will appear in the sky opposite the sun. There will be two eclipses in the holy month of Ramadhan contrary to the normal order and calculation and the eclipse of the moon. On three occasions a loud voice from the sky will be heard in the holy month of Ramadhan. Hazrat Isa, Hazrat Khizr, Hazrat Ilias, and Hazrat Idris(pbut) will give allegiance to the Imam(a.s.) when he reapers. Also Hazrat Jibrael(a.s.) will announce 313 companions of the Imam(a.s.). These 313 companions will be people of eminent piety, great knowledge and absolutely steadfast in their determination and faith towards the Imam(a.s.). Another 1000 people will be in the army of the Imam(a.s.). These people will fight battles and kill enemies like Dajjal, who will appear from India. Dajjal will have the musical tunes with him. Then the Imam(a.s.) will lead the prayers, Hazrat Isa(pbuh) will be behind him. Lets us all pray for the reappearance of Imam al-Mahdi(a.s).